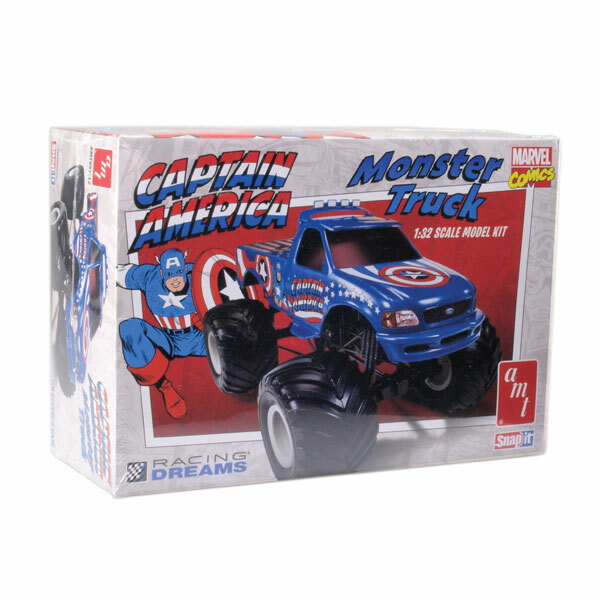 If you like your wheels large enough to live in — and have an affinity for one of Marvel Comics’ true superheroes — it doesn’t get much better than this AMT kit of the “Captain America” monster truck. Giant tires, hyper-jacked suspension, and a well-detailed chassis are the main features; the fact that it’s molded in blue, black, and white styrene (no paint needed) and that it snaps together (no glue) make it perfect for pleasant afternoons with your favorite kid — even if that kid is the one looking at you in the mirror. These build up neatly and quickly; there’s a minimum of prep needed, and once the model’s built, there’s a complete set of stickers to decorate the piece. Of course, home slot racing fans are always on the alert for 1:32 bodies, and a more accomplished modeler might use the truck (or one of the others in the series) as the basis for a more complex result. – Joe Kelly, Jr.